On Wednesday, Thursday and Friday of last week (3-5 July) I attended a course entitled “La cata de aceite de oliva virgen, cultura y maridaje” whcih translates as “Virgin olive tasting, culture and pairing (with food)”. 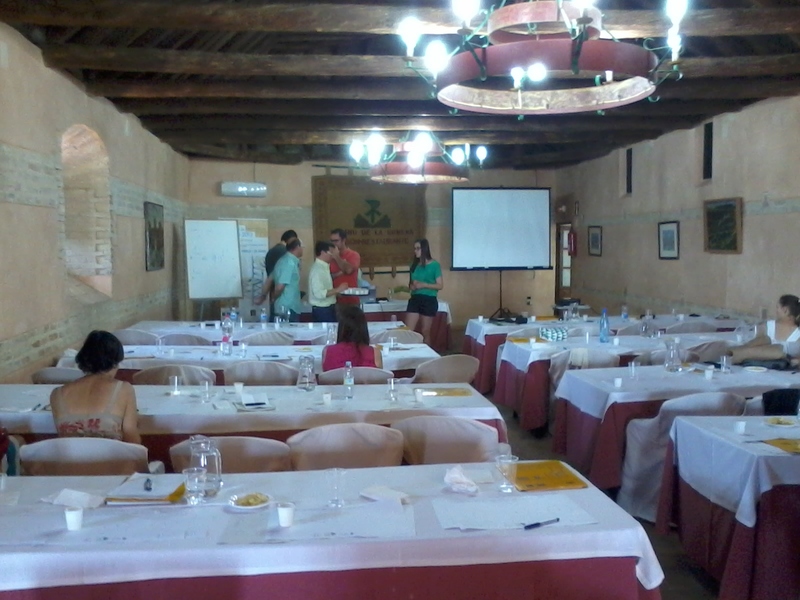 The course was organised by the Pablo de Olavide University of Seville and took place in the town of Carmona. I enjoyed the three days tremendously and learnt a lot. The tasting sessions were led by experts in the field and were superb. Below is a photo of where most of the course took place. On the Friday morning we had a class which looked at matching different olive oils with different dishes. One of the things we tasted was a simple potato puré with a great extra virgin olive oil and with a defective one. The difference between the two was enormous with the defective olive oil ruining the dish. Another interesting exercise involved tasting mayonnaise that had been made with three different olive oils. One of the oils that was very bitter and peppery ruined the mayonaisse. However, this same oil with tuna tatake was excellent.